Over a month since Greg Willis resigned abruptly from the Japanese American Cultural and Community Center (JACCC), interim CEO Bill Watanabe and board chair Sandy Sakamoto are moving past that episode, as they look to rebuild the organization with a vow to re-engage with the community. As a condition of the interview, Sakamoto and Watanabe said that they would not answer any questions concerning Willis, who served as JACCC president/CEO for eight months, nor would they discuss the circumstances of his departure. Willis, who officially resigned on Aug. 22, citing “personal reasons,” left a few days after The Rafu Shimpo published an article detailing reports of alleged corporate crimes in France, including an outstanding international arrest warrant for “possession of stolen property, misuse of corporate funds and bankruptcy by diversion” in connection with the closure of the auto parts company Le Atelier Thome Genot in 2009. The French government requested that Willis be extradited in 2010. A source at the State Department said that the Justice Department handles such requests and does not comment on them. 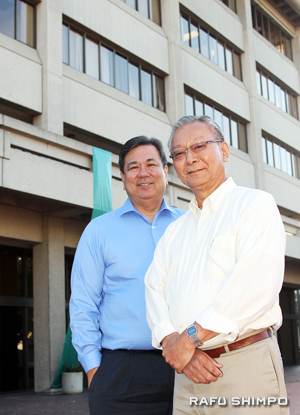 Bill Watanabe, retired executive director of the Little Tokyo Service Center, and Deborah Ching, former executive director of Chinatown Service Center, were both hired on Aug. 28 to steady the organization and assist the board as it looks for its next leader. Keith Shiozaki, hired as interim deputy director, has been given a permanent position, and is in charge of areas of finance including human relations and leases. The JACCC is also currently conducting its annual audit of finances. Watanabe said he was out of the loop and enjoying his retirement until he was called by Sakamoto, who offered him the job. Sakamoto vowed that the search process this time will be more open and transparent, and emphasized the search will not be conducted by an outside search firm. The board chair said she is open to giving staff and other stakeholders an opportunity to participate on a panel that will conduct initial candidate screenings. “We are not going to use a search firm, we are going to go out to our staff, our board, our stakeholders, our donors and others to reach out and get the word out about our search, hoping that candidates will be referred,” said Sakamoto. 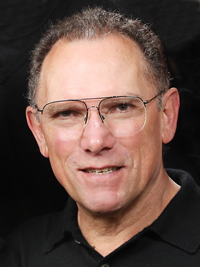 Jeff Folick, who serves on the JACCC and Keiro Senior Healthcare boards, will be leading the search. He is a senior advisor for Frazier Healthcare, a venture capital firm that raises funds for healthcare companies. His daughter, Emily, is the reigning Nisei Week queen. “I met him. He’s a very reasonable, calm, open-minded guy. He’s not a stranger to the community,” said Watanabe. The goal is to have a job announcement by next month, with a new executive director in place by the end of this year or beginning of next year. Watanabe, who previously stated he would be at JACCC for four months, said he will stay until the new executive director is found. “Debbie has a lot of experience in executive searches. She’s been a great help and she’s going to facilitate this and keep us on track. Getting Bill and Debbie on board, we couldn’t have been more blessed,” said Sakamoto. Sakamoto added that Maxine Johnston of Johnston and Company, which conducted the search that found Willis, has offered to return the fees paid to her, as well as make an additional donation to the JACCC. Sakamoto further disputed the fee range of $75,000 to $100,000 for an executive search mentioned in The Rafu. The person quoted was estimating what a typical search would cost and did not have direct knowledge of how much the JACCC paid. In terms of direction for the JACCC, Sakamoto said the board still wants to proceed with the long-range development plan that Willis had been hired to implement. The focus is to move the center away from reliance on grants and donations to more sustainable forms of revenue. “We want to broaden the audience, we want to bring fresh programs to the community, we want to be sustainable. Part of that means being able to understand the right business model,” said Sakamoto. Chris Aihara, former executive director of JACCC, commented, “I have the highest regard for Bill Watanabe and Debbie Ching as non-profit professionals and as individuals of integrity and commitment. Bringing them on to the JACCC as interim CEO and COO, I presume that the JACCC Board now acknowledges that there are fundamental differences between a for-profit and non-profit organization. 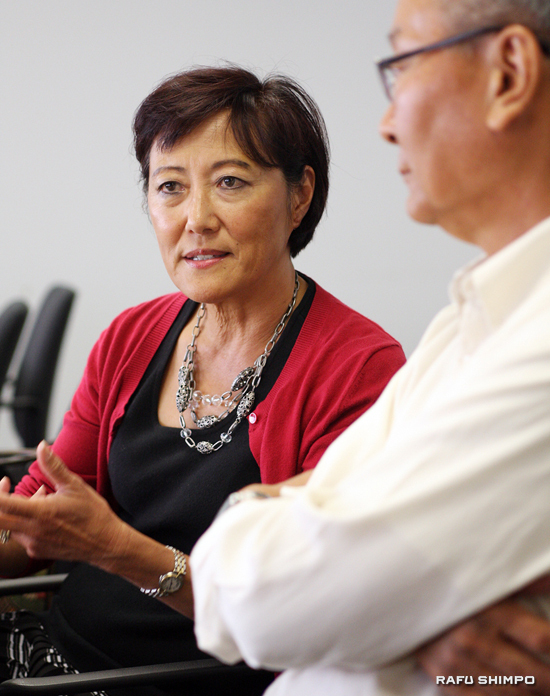 Kathy Masaoka, who was among the community members who signed the open letter to the JACCC published in The Rafu on Aug. 28, said that she hopes that the board is sincere in seeking input from their workers and the community. During Willis’ tenure, nine JACCC staff members left, some citing a hostile environment. Rafu reached out to former JACCC staffers, who did not wish to comment publicly. Watanabe said he was open to reaching out to former staff, although he said many have settled into new jobs, including an individual who is now at LTSC. “The experience of some of the people who left is valuable and I think we should at least consider it on a person-by-person basis,” said Watanabe. Sakamoto said the board has formed an HR committee that will provide guidance and oversight to staff. “We are trying to put tools in place to give our staff a voice and the opportunity to make sure that this is a healthy, good working environment for them to work in,” she said. She also praised the board for stepping up during a time of crisis. Sakamoto became board chair in 2006, overseeing a board composed of many prominent Japanese American leaders, active in both business and community organizations. The 2012 JACCC officers, as posted on their website, are vice chairs Nancy Matsui and Gary Kawaguchi, treasurer Gerald Fukui, and secretary Helen Ota, who was recently hired as the new public information officer at the Japanese American National Museum. Members include Calvin Abe, Toshio Terry Handa, Frances Hashimoto, Jeff Folick, Thomas Iino, Chris Inouye, Ken Kasamatsu, Tim Manaka Jr., Mark Muroi, Dolly Oishi, Henry Ota, George Tanaka and Minoru Tonai. A number of organizational leaders have reached out to offer their support to the JACCC, including Doug Erber, president of the Japan America Society of Southern California, Greg Kimura, CEO of JANM, and Dean Matsubayashi, executive director of the Little Tokyo Service Center. Erber and Matsubayashi cited the JACCC’s central position in the Japanese American community. “For us, JACCC in and of itself represents such a critical institution in the community,” said Matsubayashi. Erber noted that Sakamoto is also a member of the Japan America Society’s board of governors and said that his organization was helping to promote JACCC programs, including “L.A. Bloom,” to its members, and would continue to do so with future programming. “It’s a jewel for our region and our nation and it needs to thrive. Not only because of the history it’s had, but some of the incredible emotional moments that have happened in the theater,” said Erber. Erber also said he felt Sakamoto and the board were handling the crisis appropriately. Some have called for Sakamoto and the board to resign to take responsibility for the crisis. But to Rodney Kageyama, longtime volunteer at Nisei Week and frequent emcee at community events, the community deserves greater accountability, even as he applauded their hiring of Watanabe. Sakamoto said that neither she nor the other board members intend to step down, although there has been a long-term plan to change the make-up of the board. “It has been part of our strategic plan and vision in any event to transition the board into one that can support and meet the demands of where we want to be. And not meet the demands of where we were,” she said.